Inside: If you are self-employed or don’t have an employer retirement plan, check our list of alternatives to the traditional 401(k). We all need to save for retirement, but do you have an account for it, or even access to one at work? There are figures stating that only ⅓ of Americans are investing in a 401(k) or similar plan. I started to wonder why so few people were saving. Then I dug into the figures a bit more and, while 401(k) participation rates aren’t high for those that have access to them, many people don’t even have access to an employer-sponsored retirement plan. In fact, over a third of all workers don’t have access. So, they couldn’t participate even if they wanted to. Lack of access is what is pulling the numbers down so much further than they would be if everyone had access to these plans. Many Americans work for employers that don’t offer a retirement benefit plan, or they are ineligible because of the number of hours they work. There are 401(k) alternatives that could be just what you need to save for retirement. The IRA, or Individual Retirement Account, has two versions: the Roth IRA and a traditional IRA. They are both great savings vehicles and you are likely able to contribute to one, if not both, types of accounts. To be eligible to contribute to either a Roth or Traditional IRA, you or your spouse need to have earned income. Once that hurdle is crossed, then you need to be aware of limits on the contributions you can make. Beyond that, the rules vary. The Roth IRA imposes income limits on those allowed to contribute each year and so you should ensure you fall within given guidelines. The limits on income vary based on your tax filing status. Generally, if you are single, you may contribute if your income is less than $122k. If you are married filing jointly, the income limit goes up to $193k. You can check here or at the IRS website for further details. The downside of the Roth IRA is that there are no tax deductions on contributions. Besides the contribution limits, the traditional IRA imposes an age limit. You must be of age less than 70 ½ to contribute money to your IRA. With a traditional IRA, you may be able to deduct contributions from your taxable income. As with the Roth, you can use the account in addition to a 401(k), but you then may not be able to deduct the IRA contribution from taxes. Another benefit of a traditional IRA is there is no income cap that prevents a person from contributing to the account. The downsides of this type of IRA is that you pay income taxes on withdrawals and must take annual distributions after age 70. Anyone can open a brokerage account. There are no age or contribution limits and a large selection of index funds to choose from. Although there are no tax benefits to holding your retirement savings in a standard brokerage account, returns may be better than if you held the money in a bank savings account. Those are great options if you want a place for additional savings or your employer doesn’t offer a plan. But what if you are self-employed? What other 401(k) alternatives are available? Here are two of the available options. The SEP IRA, or Simplified Employee Pension Individual Retirement Account, is an option if you are self-employed. A SEP is taxed similarly to a traditional IRA in that they both allow a tax deduction for contributions, but distributions are treated as taxable income. You can save more in a SEP annually than in an IRA and you are not required to make contributions each year as some employer plans are. However, there are no catch-up contributions permitted for those over age 50. The solo 401(k) is basically a 401(k) where you are both the employer and employee and is an option if you are self-employed. Being self-employed means you can contribute both the employee and employer portions. After that, there is also the required employer portion of up to 25% of earned income. In all, total contributions cannot exceed $56k ($62k if age 50+) or your net earnings, whichever is less. The rules get a bit tricky, so be sure to check with a CPA for further details. 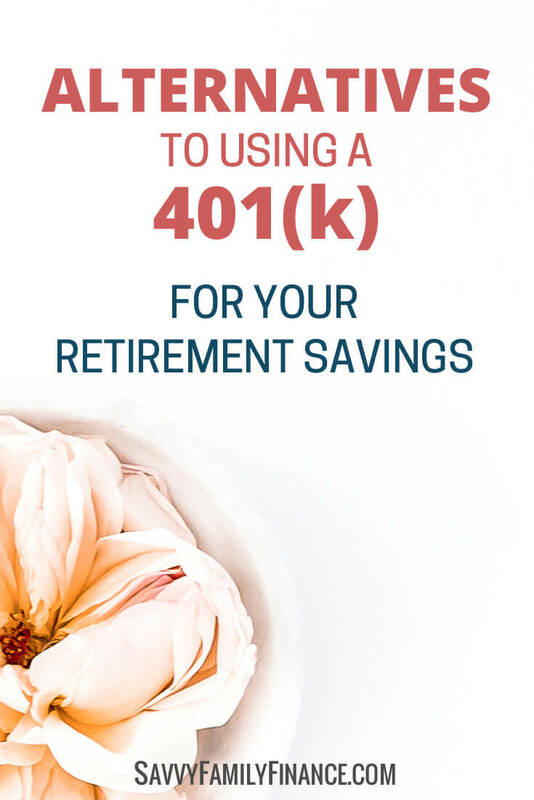 Like the SEP, a solo 401(k) has high contribution limits, but you can potentially save even more, maybe a lot more, because you are able to contribute as both employee and employer. A potential downside, especially if income isn’t a sure-thing, is that this requires annual contributions for the employer portion. The paperwork may become intimidating as the account grows, so you may want to consult with a professional. As always, if you are unsure about the steps to take to start one of these accounts, please contact your CPA or a certified financial planner. Especially with a SEP or solo 401(k), there are filing requirements and many details that aren’t covered here. Whether you are self-employed, have a side-hustle, or just want to save more, there are 401(k) alternatives you can use to meet your goals. This should help you start a conversation about retirement planning options and put more money into your future pockets.